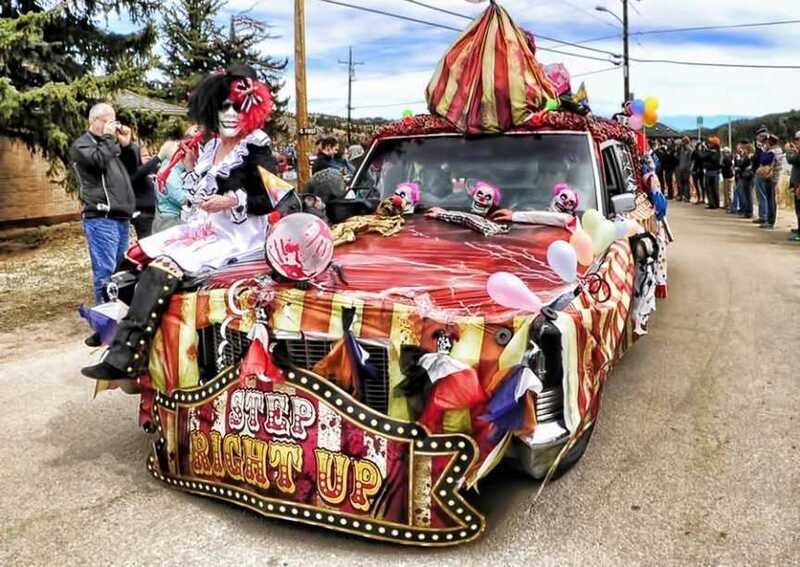 The start of the parade at Frozen Dead Guy Days. Photo by Andrew Wyatt. 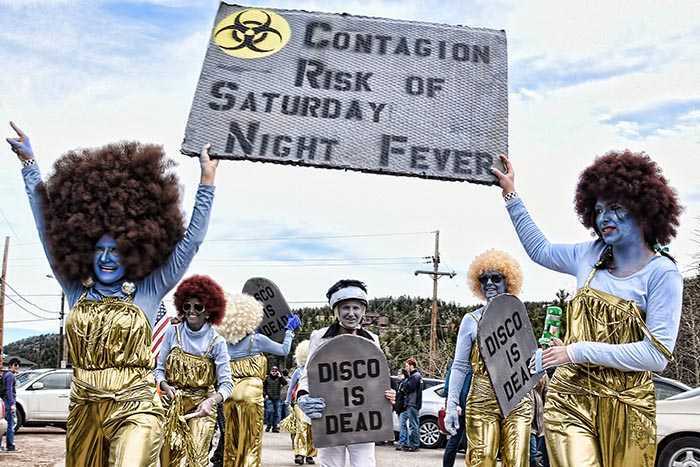 Frozen Dead Guy Days is one of the most anticipated events in Nederland, in southwest Boulder County, each year. The festival is as unique as its name. If you’re into the macabre, particularly with a joyful twist, this event is for you. But it’s not just about death and decay. It’s about frozen fun, merriment and a celebration of both those who came before us and the promise of new life after the thaw. Whether you’re into winter activities, death or just curious to experience this quirky festival, Frozen Dead Guy Days is sure to entertain. Getting There: There is no dedicated festival parking, so we recommend taking the bus. 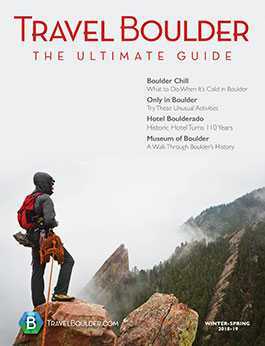 You can reserve a $10 round-trip bus pass to and from Boulder or Denver. Reserve your seats and get more info here. So where did such an unusual festival get its start? It all began with Grandpa Bredo, the heart and soul of Frozen Dead Guy Days. He died in Norway in 1989 and was promptly packed in dry ice and shipped to California. He and his family strongly support cryonics, which is the practice of deep-freezing people who have just died, under the belief that in the future, science and technology will advance enough that they can be thawed and revived. After an almost-four-year stint in California, Grandpa Bredo was moved to Colorado in 1993 to stay with his daughter, Aud, and grandson, Trygve, who were both strong proponents of cryonics. Grandpa Bredo was stored in a shed near his daughter and grandson’s home. When Aud was evicted, she was afraid he was going to thaw. But Aud spoke with Nederland’s city council, and they decided he could stay. And thus, the “Frozen Dead Guy” became a sensation. He has a dedicated “Ice Man” who keeps him at a steady -60-degree temperature and manages all tours, filmings and other visitors to Grandpa Bredo’s shed. He has been frozen for more than 20 years, and 2018 marks the 17th year that Frozen Dead Guy Days has been honoring him. 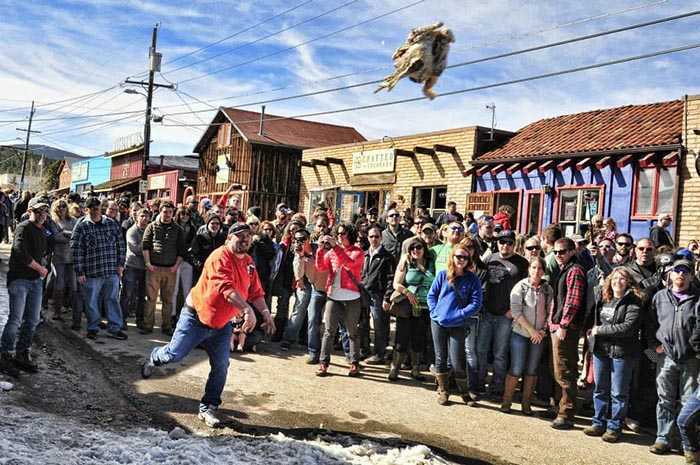 Turkey bowling at Frozen Dead Guy Days. Photo by Andrew Wyatt. Snowy human foosball: life-sized foosball with real people. There are prizes for the winning teams, and part of all the proceeds from registration fees support the Nederland Food Pantry. Costumed Polar Plunge, where you can dress in your death best and compete for Eldora Midweek 2018/19 Season Ski Pass. Ice Carving Competition, after which you can vote on your favorite, but be quick. These sculptures won’t last long. Ice Turkey Bowling, which is exactly as bizarre as it sounds. Use a frozen turkey to test your bowling skills. Bring your own turkey if you have a secret to frozen bird bowling. Also see fix-a-frozen-flat, where you can compete to see who can change a flat tire after submerging their hand in a bucket of ice water; frozen T-shirt contests; and the “Newly Dead Game” to test how well you really know your partner. Part of the Frozen Dead Guy Day parade. Photo by Andrew Wyatt. If getting doused in freezing water or athletic events aren’t your thing, don’t worry. There are plenty of noncompetitive events at Frozen Dead Guy Days for you to enjoy (not to mention all competitive events are open for public viewing). The Royal Blue Ball is one of the most popular events at Frozen Dead Guy Days. There is a costume contest for best-dressed Ice Queen and Grandpa Bredo, but it’s not required. This event also offers live music from Flash Mountain Flood, Electric Toast & Butterfly Friends and Dead Floyd, as well as a gift shop. You can also enjoy a pancake breakfast, a parade where those participating in the coffin races show off their coffins and the “Grandpa’s in the Tuff Shed” documentary, which tells the story of Grandpa Bredo. There are three music tents that have live performances all weekend from both local and out-of-state artists. The Blue Ball at Frozen Dead Guy Days. Photo by Andrew Wyatt. There is a dedicated “Bacon, Bourbon and Brews” tent, where you can sample some of the areas best beers, spirits and bacon. 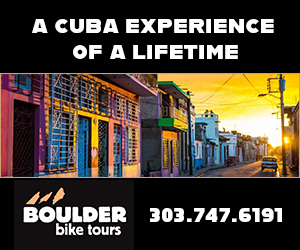 There are also outdoor food and drink vendors from local restaurants, including Hog Wild from Fort Collins, Super Heady Tacos from Pearl Street in Boulder, The Vegetable Express from Nederland and multiple other food trucks and vendors. Craft beer and cocktail options include Upslope, Wibby, GrossenBart, Seagram’s 7 and more.